Did Urban Outfitters steal this jewelry maker's design? (CBS) - When we saw Urban Outfitters trending on Twitter today, we assumed there must be a killer sale. We clicked to find out what everyone's all riled up about. Apparently, the hip retailer has grown a buzz because they're being accused of ripping off an idea from an independent designer... again. Two days ago, Chicago jewelry maker Stevie K wrote on her blog, imakeshinythings.com, "Not cool Urban Outfitters, not cool." 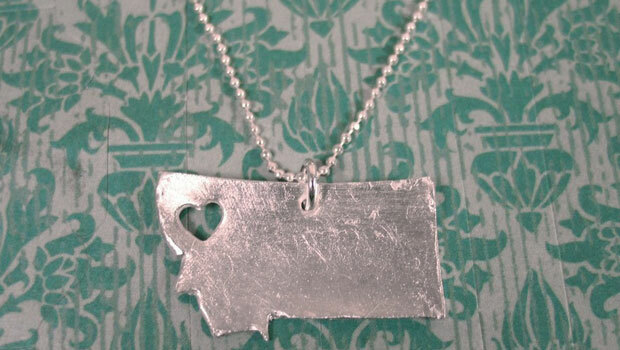 In the post, Stevie K shows a screenshot of Urban Outfitters' I Heart Destination Necklaces, featuring states with hearts cut out, which costs $19. This irked the independent designer because she says it's her design. She has been selling these necklaces at her Etsy store, tru.che, for $55 each. "My heart sank a little bit," she said in her blog. "I'm very disappointed in Urban Outfitters... I'll no longer be shopping at any of their stores." Stevie K claims the retailer also stole the item name and some of her copy. Supporters took to Twitter to spread the word and are vowing to never shop at the store again. @Conorrhea tweeted, "Urban Outfitters should be boycotted. Business at its worst." @cassieface tweeted, "Sad sad sad. Totally disappointed in Urban Outfitters for blatantly ripping off independent artists." This is not the first time Urban Outfitters has been accused of being unoriginal. Lillian Crowe, a designer who sells jewelry featuring a rib cage, told The Brooklyn Paper she discovered a knockoff of her creation on Urban Outfitters' site in March. We went on UrbanOutfitters.com to find both necklaces in question, but they've been pulled from the site.